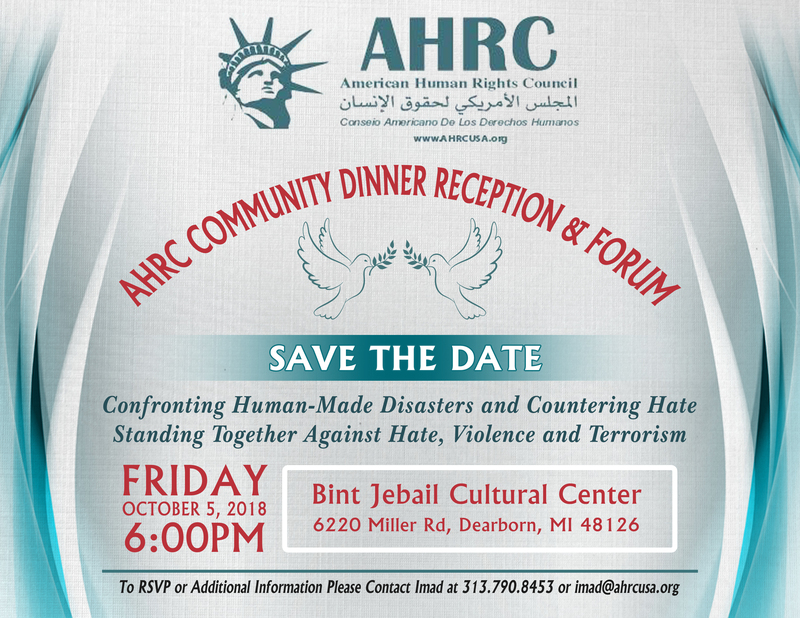 On Friday October 2018 at 6 p.m., The American Human Rights Council (AHRC-USA) is hosting a special community dinner reception and forum titled: “Confronting human-made disasters and Countering hate- The challenge of creating a culture that counters terrorism and other forms of violence.” The Reception will be held at Bint Jebail Cultural Center located on Miller Road in Dearborn. AHRC Reception and Forum is an annual event designed to highlight pressing challenges facing the nation and the world. Last year, AHRC’s Awareness Dinner Reception focused on the Refugees crisis as challenge facing America and the rest of the world. This year’s reception will focus on the rapidly growing and ongoing challenge of acts of hate and violence including mass-shootings at schools and other places making the challenge of mass violence a local, national and global concern. Nationally and locally, interest in the issue of mass violence is sporadic, often a response to an act of mass violence. The interest ebbs and flows with the news cycle reporting of mass violence. We at AHRC believe that the nature of this challenge mandates a serious, deep, effective engagement and constructive dialogue with all stakeholders, including government stakeholders. Knowledge is a key tool in the effort of countering violence and this event provides the forum to hear from experts and stakeholders. This exchange of knowledge, experience and insights is vital to help form a nuanced understanding that enables the development of a strategic plan of action and define an effective method of countering mass violence and the hate it is grounded in. The reception will serve as an occasion to highlight this challenge from different perspectives as common threat and a common danger that require effective and ongoing engagement between people and government. The reception’s program will include remarks by different invited guests and experts to address this challenge. AHRC will release more information and details in the near future. AHRC welcomes all support, donation and sponsorship that will help us assure the success of this important forum for the future of our communities. Become a proud sponsor of this important forum, $500.00 for a table of EIGHT (8) guests and $50.00 is the individual ticket. Students and low income will be accommodated upon request. Media are welcome to attend, prior RSVP, required. Please call 313-790-8453 or email: imad@ahrcusa.org for more information. Deadline to RSVP or become a proud sponsor September 15,2018. No Exception due to special arrangements.